Student work from Art Workshops for Young People, an offering of the art education dual program in Syracuse University’s College of Visual and Performing Arts (VPA) and School of Education, will be exhibited in “The Big Show” on Saturday, Nov. 12, from 10 a.m.-noon in the Art Education Wing (rooms 043, 044, 045, and 051) of Comstock Art Facility, 1055 Comstock Ave. The exhibition is free and open to the public. Free parking is available in the Manley North lot. The semester-long Art Workshops for Young People are taught by undergraduate and graduate art education students. Nine workshops in two different time sessions are offered each semester for children ages 5–14. 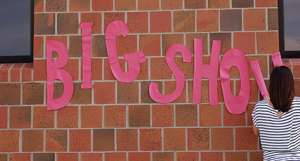 “The Big Show” is the culminating exhibition. Ninety children participated in the fall 2011 semester workshops.